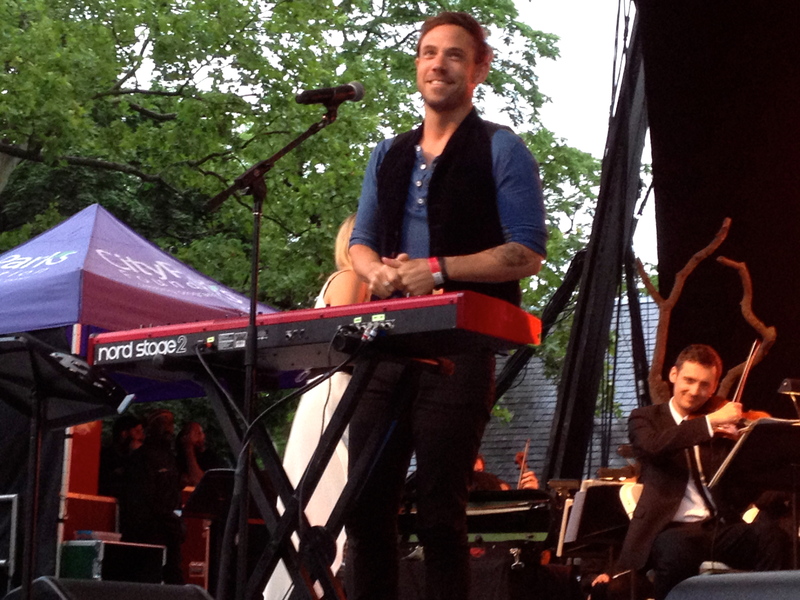 It was around halfway through the show when Airborne Toxic Event lead singer Mikel Jollett joked with the crowd that he may mess up “Dublin,” a new song he had only played a few times live. But as he plucked the first few acoustic notes of the piece, the sky painted on the horizon transformed from a dense gray to a palette of pink that penetrated the skyscrapers and accentuated the rich music. The halcyon scene demonstrated the model of an outdoor concert. But, the weather doesn’t always respond. 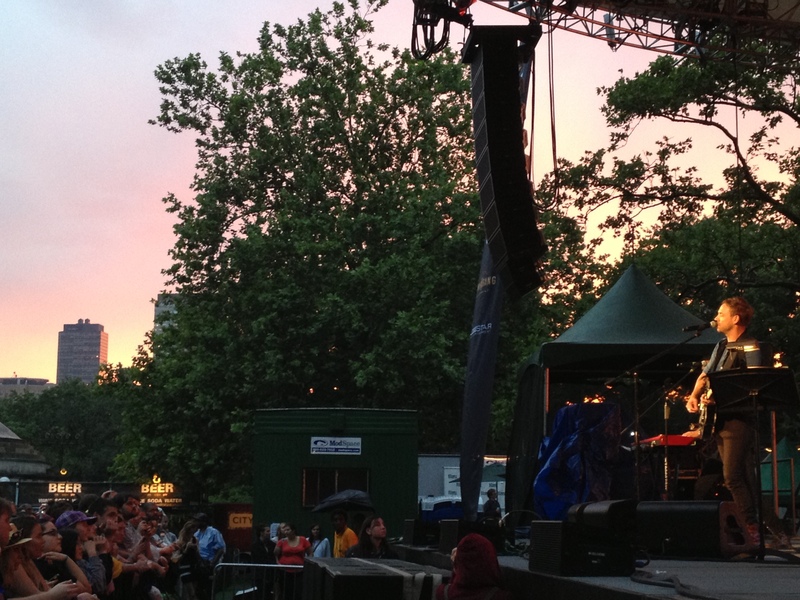 As the above picture suggests, when we arrived to Central Park Summerstage, the weather was less than ideal. 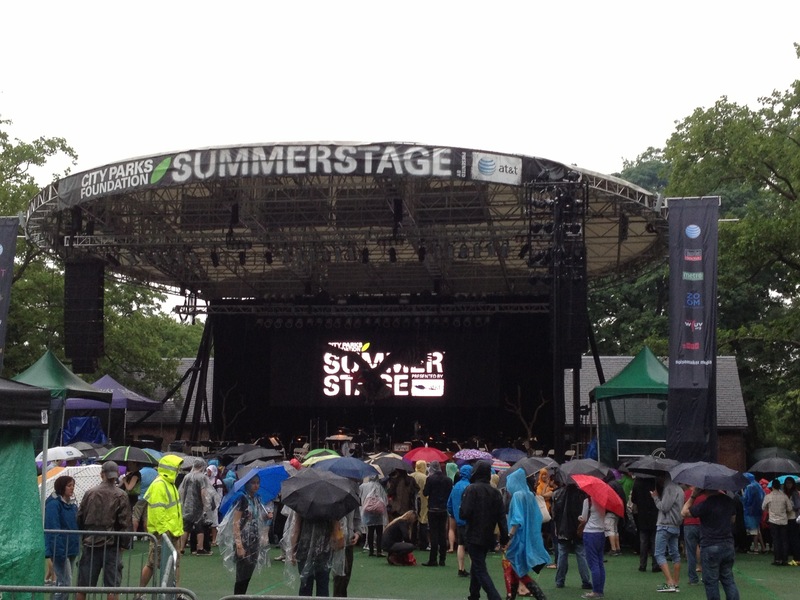 A persistent sprinkle fell on umbrellas and Summerstage ponchos. The Calder Quartet, a LA-based string quartet that has become an Airborne Toxic Event staple, opened, and, for the most part, drove the rain away. Ensemble LPR, an assemblage of the finest New York-based concert musicians, joined The Calder Quartet on stage after the Quartet’s opening act. If one stumbled into Summerstage – which was quite possible considering that the concert was free (thanks to the generous City Parks Foundation), he/she might have assumed the crowd had gathered for a classical orchestra. And that was one of the most gripping parts of the show. It was just not your typical rock show. 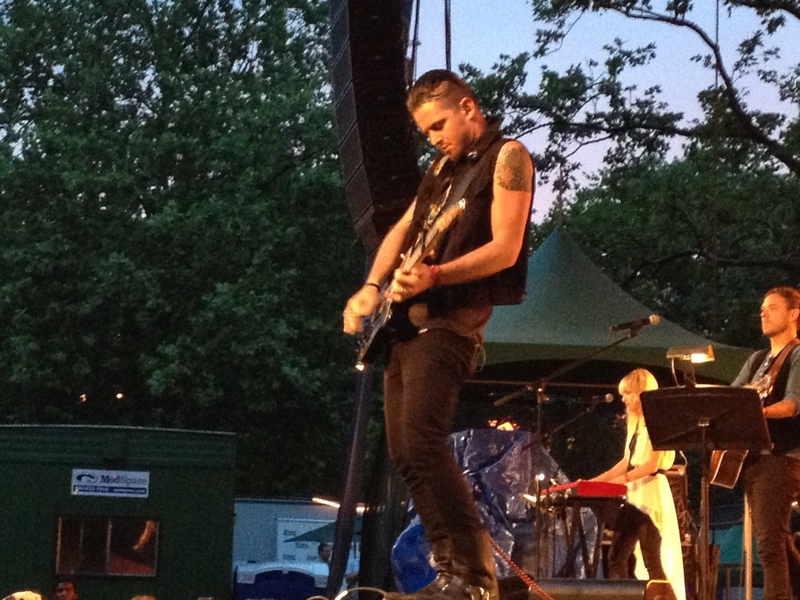 But, to be honest, I don’t believe anyone in the audience was expecting a typical rock show, because Airborne Toxic Event does not put on a typical rock show. The energy and skill demonstrated by the band is striking. It is not just music; it is art. Instead of simply creating catchy alt/rock pieces, Airborne Toxic Event prefers to script a scene (much like the inspiration for the band’s name, Don DeLillo), and this ability sets the band apart from others. Perhaps the greatest indication of this individuality was the crowd at the show. Lining the front row barrier behind the photo pit was a wide array of ages, and, most surprisingly, everyone knew the words to each song. These were Airborne Toxic Event diehards, and, unlike with most bands, I couldn’t typify the standard Airborne Toxic Event fan. This evinces the diversity of the band and explains its growing audience. The crowded stage of talented musicians produced a full orchestra sound that elevated the show. It is clear that Airborne Toxic Event is not a band; it’s a symphony, a full on powerhouse that combines the potency of a full orchestra with a traditional genre and bends it. The resulting amalgamation is music that could only have been created by the mind of true artists! This was best portrayed by the performance of “Sometime Around Midnight,” one of my favorite Airborne Toxic Event songs because of its sheer ardor. Not only did the orchestra carry the crescendo, but also most individuals in the audience knew the lyrics and emphatically sang along. It was electric. 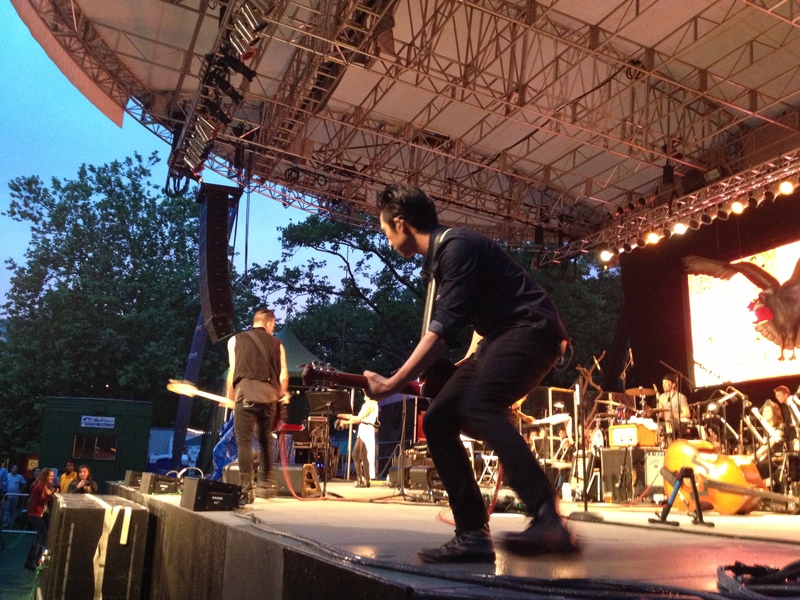 Check out the Summerstage schedule.